This charger is an upgraded product of the XP4c and VC2 chargers. This product is produced under the key principle of protecting and caring for the environment. 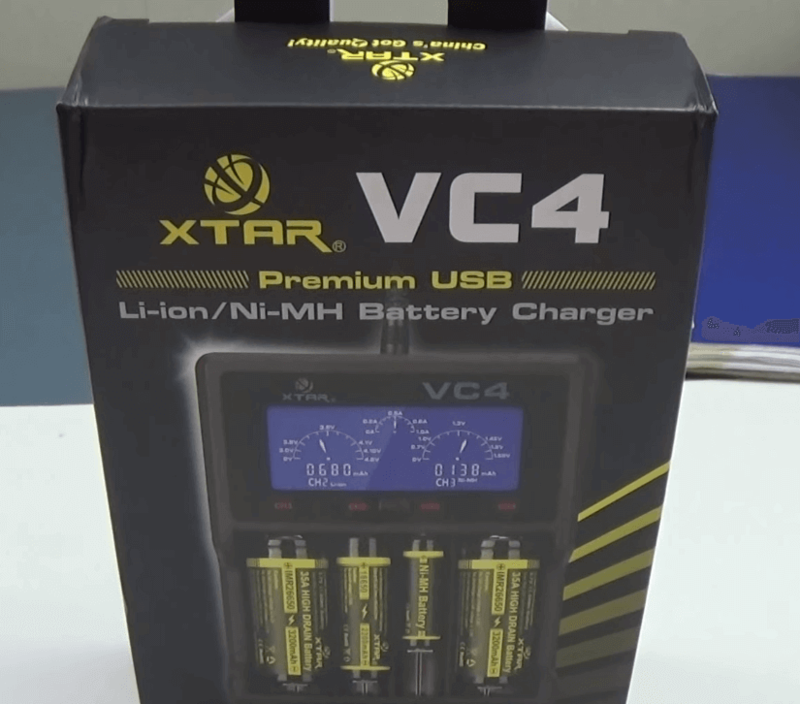 The VC4 charger is a production of XTAR CO., Ltd. While in use the charger is able to recognize, show and power both Ni-MH and Li-ion batteries at a go. The charger is also able to show you the ongoing charging, charging capacity and the battery voltage. For more details, you can check the article of 18650 battery charger reviews. It has a unique LCD screen for displaying current charging. The LCD backlight has the ability to switch off or automatically into a less light mode within two minute which saves on energy. It has a clear display of battery voltage and charging capacity. The battery is able to automatically go off once the battery is fully charged and can restart the charge if the battery voltage is lower than 3.9V. This battery is protected from overvoltage related occurrences, short circuit dangers and overcharging implication. It has and an output voltage of 12V 1A and an input voltage of DC 12V. It is fitted with 4 independent charging slots. It has an informative display that is backlit. The charger has a great charging speed that powers even using a USB powered power source. It is well developed with excellent materials that are resistant to fire. The battery has soft start charge thus protected against high current charging which will prolong your batteries lifespan. This will also save you from having to spend again on getting a new charger. There’s no need for you to purchase many charges as it can effectively charge both the Ni-MH batteries in a single powering. While using this charger you will be able to save time and energy while maximizing your battery performance. Since this charger has the capacity to switch off once the battery is full, you can leave it alone overnight or without watch making it efficient and reliable. Also, you do not need to worry about overheating since the battery has a fitted protection against such. It can be easily connected to any USB power source and adapters on the wall thus easier to use and diversified. This feature makes it much more reliable for charging with other power sources such as the power banks. You can as well charge using the solar panels which are fitted with USB charging outputs. It has easy steps of putting in batteries and pulling them out once fully charged thus easy to use. The batteries are able to remain cool throughout the charging and if wrongly inserted you are able to easily notice. This is because it cannot charge wrongly inserted batteries. Through such you are also able to detect effects on your cells while charging. The charger does not have refresh functions, in any case, there was a malfunction during the charging process. It cannot power other cells such as Ni-CD batteries. You, therefore, have to purchase those batteries that are compatible with it to make its usage relevant to your needs. Does not give great alternatives for viewing angles as one is confined to viewing from above and behind. It does not offer an option of manually setting up the charging speed. Thus, giving you less control over how you power your battery. The mere fact that this charger is able to remain cool while charging your battery is an indication of a friendly gadget without fear of spoiling your battery. Most users have given positive feedback on its efficiency especially on the fact that you can be able to charge four cells at ago. The charger is made from durable ABS components that are environmentally friendly and secure. The price of the charger is fairly cheap making it affordable while meeting your needs. The charger is great even for use with multi people as long as the cells inserted are compatible ones. This charge is the best thing anyone can think of owning due to its durability and flexibility.